Record Description GRI-1 â€“ boundary stone number one of the first 21 around Grinton Parish starting from Stolerston Stile and reaching as far as Gibbon Hill. GRI-1 is on the Grinton side of a high wall and is marked on the OS map as Stolerston Stile. It is inscribed S and ED, and therefore appears to have been erected to mark the boundary between the estates of the Erle-Drax family of Ellerton Abbey and presumably someone whose surname began S, who held the land on the Grinton side of the line. Ellerton Abbey estate was held by people with the surname Erle-Drax from 1755 when it was inherited by Thomas Erle-Drax, the eldest son of Henry Drax and Elizabeth Ernle, heiress to the Erle family estate in Charborough, Dorset. The last person called Erle-Drax to hold Ellerton Abbey, John, died in 1887 leaving the estate to his son Richard, who adopted the splendidly quadruple-barrelled surname Plunkett-Ernle-Erle-Drax, but called himself Richard Drax for short. Suggestions for the surname beginning S are invited. Additional Notes â€œFrom Hollow Mill Cross to Stollerstone Stile, the extent of Swaledale is twenty long mileâ€, so goes the folk rhyme to describe the old lordship of Swaledale. The earliest known record quoting these west-east extremities of the boundaries is dated c.1538. 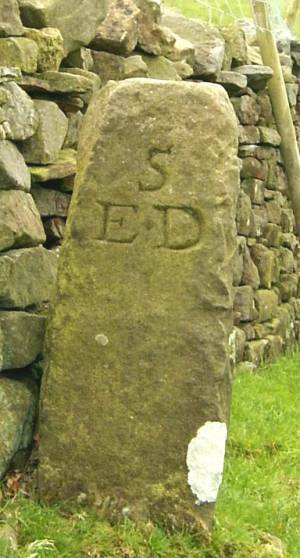 There are later references that claim the boundaries were originally defined in a now-lost charter by Gilbert de Gant on inheriting the lordship of Swaledale from his father Walter in 1139 (Stephen Walker: Nine Standards, 2008, p58-59 and p130; and www.ninestandards.eu).